From the approaching holiday season to the New Year, there are a lot of things to prepare for when it comes to the winter. 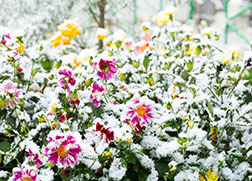 It’s important, though, not to forget about the needs of your lawn for the upcoming cold season. If you’re wondering how to ready your trees, your plants and your yard, here are some tips for saving your vegetation until the springtime. It might seem like a waste of time to fertilize your grass going into the winter months, but this is actually the perfect time to prep it for spring. As fertilizer will provide much-needed nutrients to the grass in the months when there is less growth, it will actually stimulate improved growth down the road. It’s just important to ensure that you provide a consistent amount of fertilizer so a patchy-looking yard can be avoided. Since weeds scale back in winter, like most other varieties of plants, it can also be an ideal time to apply a herbicide. While plant maintenance duties like pruning can be done in the spring or fall months, it can actually be a better idea to give your plants the summer months to grow before diving in. Cutting them back will enable the plant to focus its energy on maintenance through the cold winter months, so it’s a good idea to get to work in before the first signs of cooler air set in. If you happen to have plants that won’t last through the winter, you’ll want to compost them so they can be used for soil in the next gardening season. Beyond the garden and the lawn, it’s also worthwhile to provide a little care for your favorite trees before the winter hits. While you’ll want to be cautious about what you do and may want to consult with a gardening professional, clearing away dead branches can help your tree retain its health throughout the year. You may notice the difference in your trees when the spring rolls around again, as they’ll likely have a revitalized look and show signs of new growth. Winter is a busy time for many people, but it’s important to make the time to fertilize your grass and prune your perennials so your yard will be ready for spring.